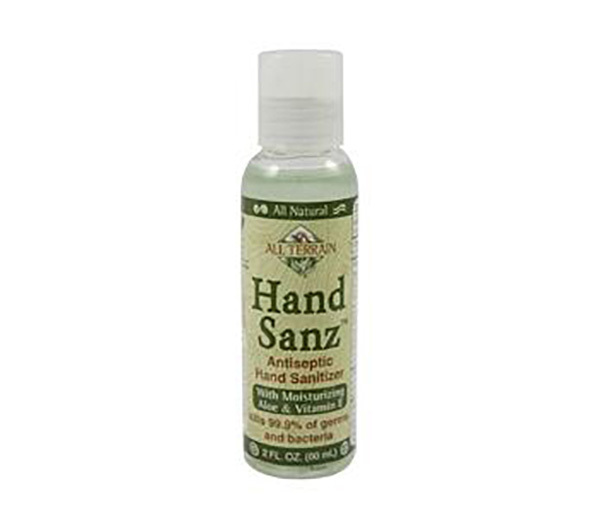 All Terrain Hand Sanz w/aloe & E is a natural hand sanitizer proven to kill 99.9% of germs and bacteria, pneumonia, e. coli and MRSA. Carbomer-free, it uses wood cellulose and vegetable glycerin to thicken the 62% alcohol into a gel. Moisturizing to the skin, it does not leave skin overly dry which is the #1 complaint about hand sanitizers in general. With aloe and vitamin E for extra moisturizing power. Note About All Terrain: All Terrain's primary mission is to manufacture and sell quality Natural Remedies for Outdoor Enthusiasts. Environmentally conscious, All Terrain's products have all natural, biodegradable ingredients and their packaging is made from recycled, recyclable, or biodegradable material.